In addition to reading we also love cooking and perhaps even more than cooking we LOVE to bake! 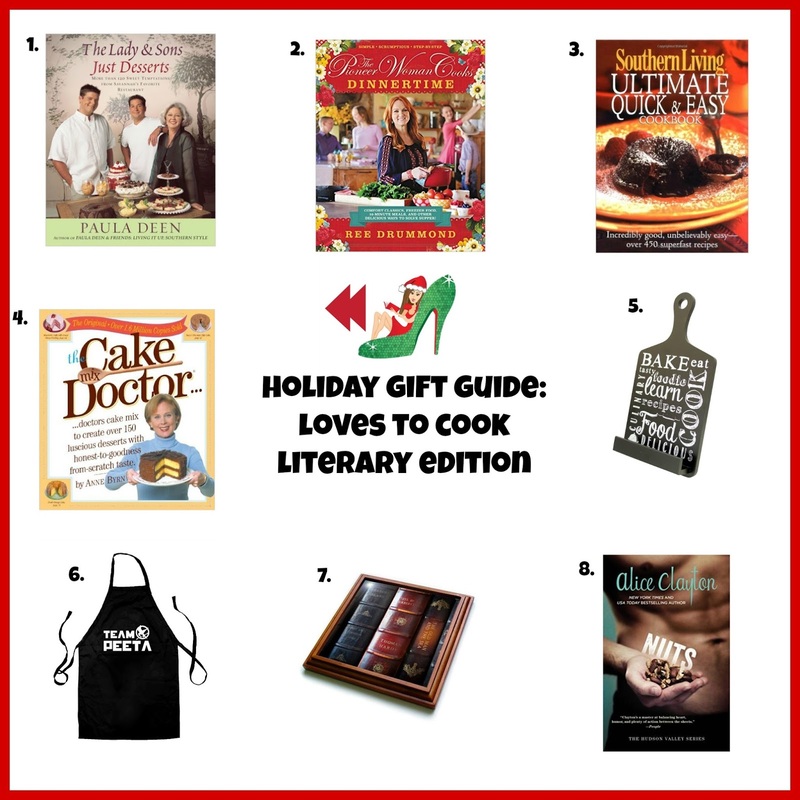 So what better of an idea to give someone who both loves to read and cook than a cookbook themed gift? But looking for the perfect cookbook can definitely be overwhelming with so many choices on the market so, we've listed a few of our absolute favorites, ones that we know without a doubt will result is successful, delicious dishes! 1- Paula Deen's Just Desserts - Controversy aside this woman knows how to cook and her recipes are prove it time and time again. Every single one of her recipes I've tried have been a success earning multiple compliments. You might also consider The Lady & Sons Savannah Country Cookbook Collection - these two books are full of all kinds of dishes, not just desserts. 2 - Pioneer Woman Cooks Dinnertime - The first time I ever learned of Ree Drummond was while on the tradmill at the gym. As I was walking I was watching her make homemade glazed doughnuts. She was funny, down to earth and those doughnuts not only looked easy to make but melt in your mouth good. Soon thereafter I bought my first Pioneer Woman Cookbook and my fan status was sealed. Her cookbooks are beautifully filled with pictures outlining each step and she writes just like if you were having a conversation together. Every single time I make one of her dishes I am flooded with praise. Pioneer Woman Cooks Dinnertime is the newest book in her collection, having just released this past October -- This is one I put on the top of my Christmas Wish List! 3 - Southern Living Ultimate Quick and Easy Cookbook - I bought this one years ago from a Souther Living at Home party and it's one of my favorite ones. Filled with tons of pictures and recipes for meats to side dishes to desserts and drinks. In case you didn't know or couldn't tell we're southern girls and we love good food and the pages of this particular book will have your mouths watering! If you get it check out the Chicken Parmesan - it's a favorite of my family! 4 - Cake Mix Doctor - Do you like to bake or does it scare you?!?! I love it and this is one of my go-to cookbooks. Each recipe starts out with a boxed cake mix you "doctor" up and I'm telling you they are moist, delicious and most importantly easy to make! Also check out Chocolate by the Cake Mix Doctor and Cupcakes by the Cake Mix Doctor. I have all 3 cookbooks and they are fantastic. The first couple of the pages are filled with color pictures of the recipe options, so you can see what looks good visually and flip to the recipe! 5 - Cookbook and Tablet Stand - Something every kitchen needs! This stand will not only hold your tired and true cookbooks, but for those of you following a recipe on Pinterest you can prop your tablet up in this stand as well! 6 - Team Peeta Apron - We can't have a cooking gift guide without mentioning our favorite fictional baker, Peeta Mellark! So grab your Hunger Games friends an apron! Who wouldn't want to bake bread with him? 7- Antique Book Trivets - As you are cooking all the dishes from these awesome cookbooks, you will need somewhere to place your hot dishes! We love these trivets that pay homage to some of the best antique books. If you don't use trivets, you can always use them as wall hangings as well. 8 - Nuts by Alice Clayton - We are HUGE Alice Clayton fans and we loved her most recent release about Roxie Callahan - a private chef to some of Hollywood’s wealthiest, and nastiest, calorie-counting wives. After a dairy disaster implodes her carefully crafted career in one fell ploop, she finds herself back home in upstate New York, bailing out her hippie mother and running the family diner.